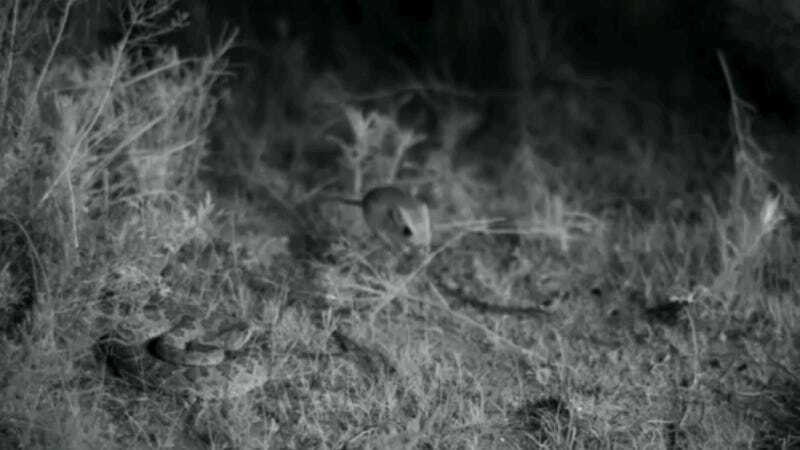 Mohave rattlesnakes and Merriam kangaroo rats are currently embroiled in an evolutionary arms race, pitting wily predator against fast-acting prey. Dramatic high-speed video shows how quick and creative snakes need to be to launch an attack—and how rodents still manage to evade capture. Surprisingly, very little is known about rattlesnake attacks. But new technological advances in high-speed cameras are making it possible to capture three-dimensional videos of these lightning-fast strikes in the wild. A team led by University of California-Riverside biologist Timothy Higham used such a setup to film Mohave rattlesnakes in action, allowing them to understand the factors that determine the success or failure of an attack or an escape. Their findings now appear in the latest edition of the journal Science Reports. Watching the high-speed video (filmed at 500 frames per second), Higham’s team noticed that the snakes performed better and struck faster in the wild than in laboratory conditions. Horrifyingly, maximum velocities achieved during strikes ranged between 4.2 to 4.8 meters per second. For an animal that’s crouched motionless in a coil, that’s an insane amount of speed. It’s cool to watch, but for prey animals, that doesn’t leave them much time to react. Not content to stick with speed as the lone tactic, the snakes were also observed to mix up the style of their attacks. Strikes occurred from a wide swath of distances, ranging from 1.8 to 7.9 inches (4.6 to 20 cm). When the snakes failed to capture their prey, it was either because the kangaroo rats made an evasive maneuver, or because of the snakes’ poor strike accuracy. Looking ahead, the researchers are hoping to observe other species of rattlesnake and kangaroo rat to explore any differences among the species. Until then, you can marvel—or wince—at the ferocity of these horrifying rattlesnake attacks.